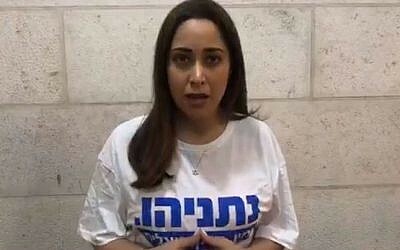 On Tuesday (4/09), hours before she won a seat in Israel’s Knesset, she reached out to voters in one last Facebook video. Golan, an incoming legislator for Prime Minister Benjamin Netanyahu’s Likud party, will be one of the youngest members of the Knesset at age 32. She has spent years protesting against African asylum seekers in her Tel Aviv neighborhood. In 2017, she said “A Palestinian state is a terror state.” She has appeared on Fox News’ “Hannity” and criticized Hillary Clinton. According to the 2018 Israeli Democracy Index (an annual study by the Israeli Democracy Institute, a nonpartisan Israeli think tank), approximately 64 percent of Israeli Jews aged 18-34 identify as right wing, compared to 47 percent of those 35 and older. An Israeli Democracy Institute survey conducted just one week before Tuesday’s election likewise found a direct correlation between age and support for Prime Minister Benjamin Netanyahu: 65 percent of Israeli Jews aged 18-24, and 53 percent of those 25-34, favored Netanyahu winning re-election, while 17 percent and 33 percent, respectively, preferred his more centrist rival, Benny Gantz. 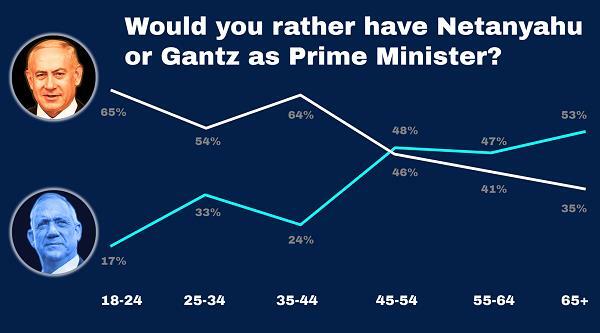 Younger Israeli Jewish voters strongly preferred Prime Minister Benjamin Netanyahu to rival Benny Gantz, an elections survey by the Guttman Center at the Israel Democracy Institute shows. The survey was conducted on April 3, 2019. 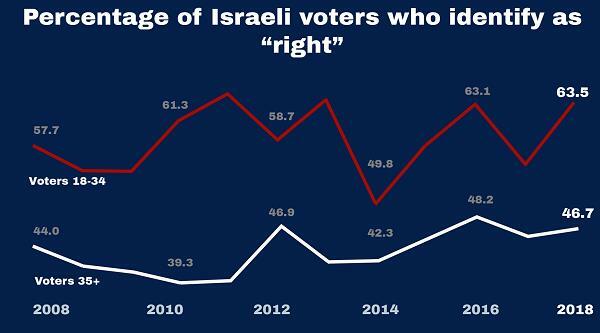 Younger voters in Israel have been disproportionately right-wing for a while. The percentage of Israeli 18- to 34-year-olds who self-identify as right wing is consistently higher than the percentage of the general electorate, according to the survey. Young Israelis grew up during the second intifada, which saw hundreds of Israelis killed in suicide bombings. The aftermath of the 2005 disengagement from Gaza, which occurred when this group was between 4 to 20 years old, has led many young Jewish Israelis to resent any leader who is willing to cede any more land currently under Israeli control. Since most of this group has served in the army, successive wars in Gaza have only hardened that perception. 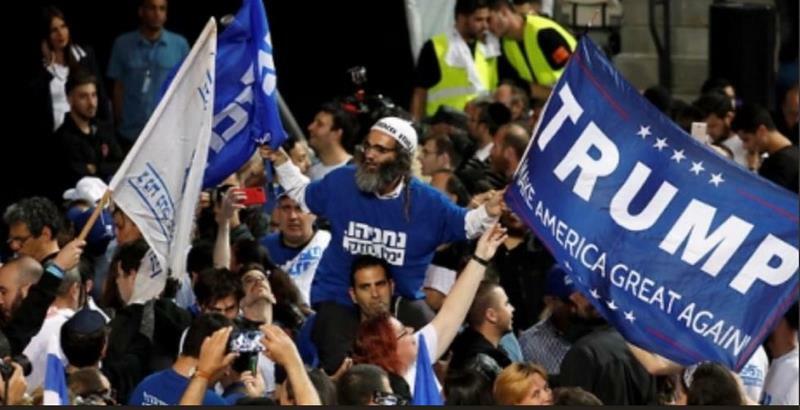 For younger religious Zionist voters in particular, the disengagement, which displaced some 8,000 Jewish settlers, “was considered an absolutely devastating moment that they’ve vowed never to return to,” says Dahlia Scheindlin, an Israeli political analyst and a public opinion expert. So did Jewish millennials deliver Netanyahu this election? It’s a bit too soon to tell. But Scheindlin says that while exact figures aren’t out yet, it’s safe to assume that the right wing had youth on its side. After all, they love Bibi and Donald Trump! Laura Adkins and Ben Sales are reporters for the Jewish Telegraphic Agency in Israel.